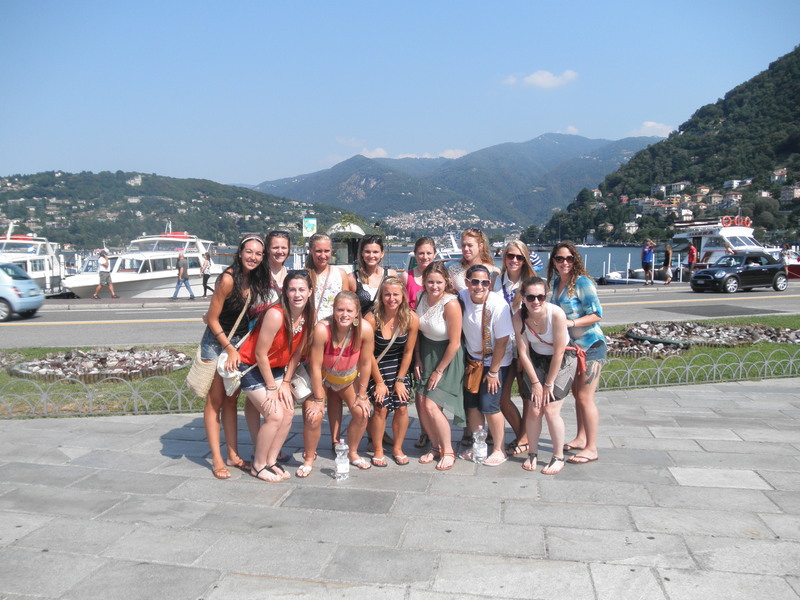 The team in front of Lake Como. 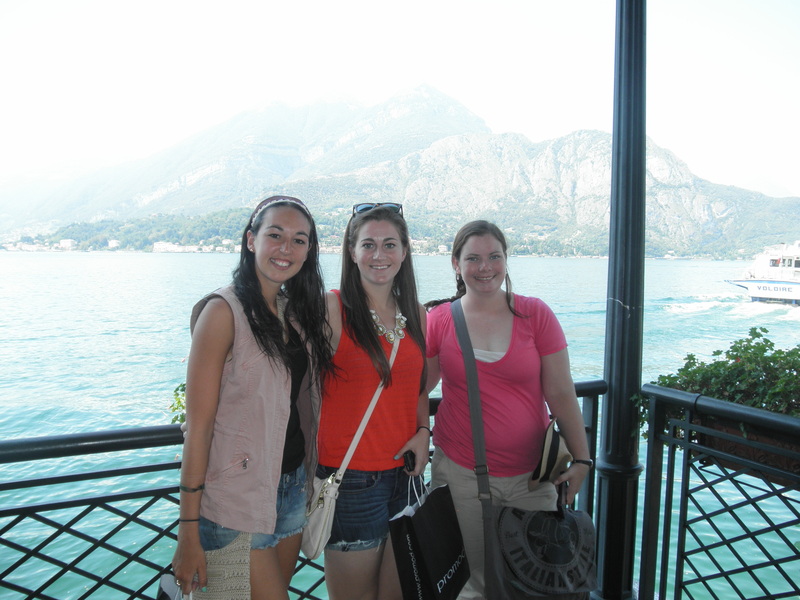 Today we began our sightseeing again in Lake Como. The ride to Como from our hotel was pretty quick compared to our rides before. 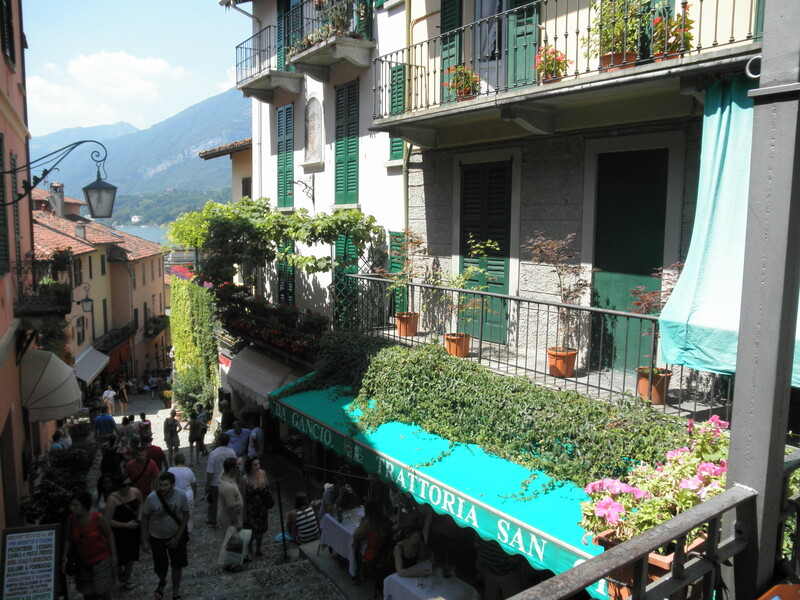 Once we got to Lake Como, we had the option to go to Belagio or stay in Lake Como. My group decided to take the fast boat to Belagio. We had around an hour in Como before we had to board the boat, so we decided to shop! We found this neat store called “promod” where we all bought a few things. We also taught the cashier what the register was called in English, while she tried to talk to us in Italian. Haley and I in front of Lake Como with our shopping bags. 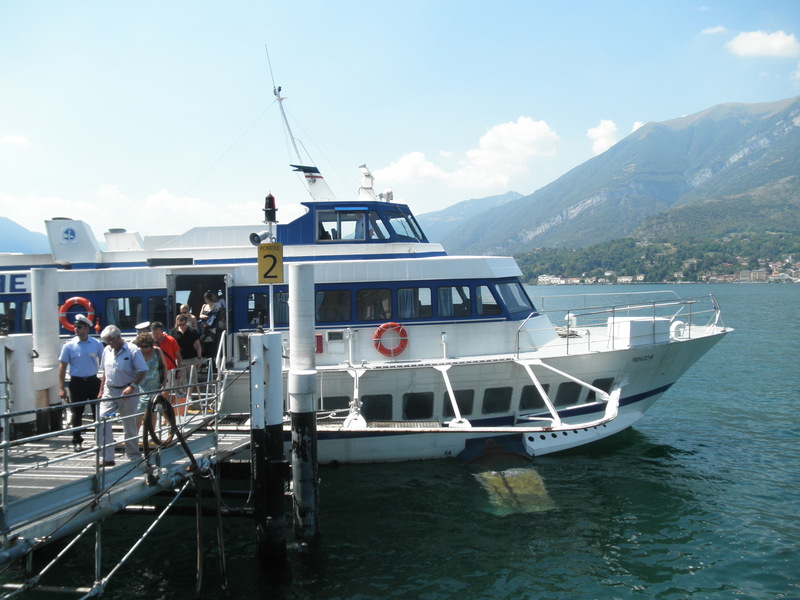 After shopping and walking around Como, we went to board the boat, which was much different than our boat ride the other day. This one was fast, but it felt more like a car ride, since there were not as many waves. Lake Como is beautiful; You are surrounded by mountains and houses in the mountains. The boat after we got off in Belagio. Ali, Liz, and I right when we got off the boat in Belagio. Once we got to Belagio, we were all starving so we looked for a place to eat for lunch. It took us a while before we decided because many of us wanted bruschetta, but for some reason no restaurants in Belagio had it! Some of us ended up getting pizza, while others, including myself, got an Italia panini (tomato, mozzarella, and lettuce). We got “take away,” which is “to go” and brought our lunch by the lake to eat. After we finished we stopped at a gelatoria and got gelato cones. We then got bus tickets and took a bus back to Como. The bus experience was a lot different than home. These bus rides are crazy; they drive super fast around a cliff. Although it was scary, the view of the lake was beautiful, as well as the houses we got to see on the other side of the road. When we got back to Como, we had a little time to walk around the town again. We just roamed the streets and went into a few shops before we had to meet our bus to go back to the hotel. After getting back to the hotel we had a pre-game dinner of various fruits and cheeses, pasta with red sauce, and salad. We had a little time to rest after dinner and then we headed off to the field for our game against Como 2000. We all were pumped to play under the lights on this amazing field, and we definitely came out a lot stronger than our last game. We scored the first goal, header goal, in the first half off a corner! They came back and scored a goal on us a few minutes before the first half ended off a cross from the field. The game was competitive and I’m sure interesting to watch. We ended with a tie 1-1, but we were very happy with our play. Some people even asked our players if we had anyone on the National team! 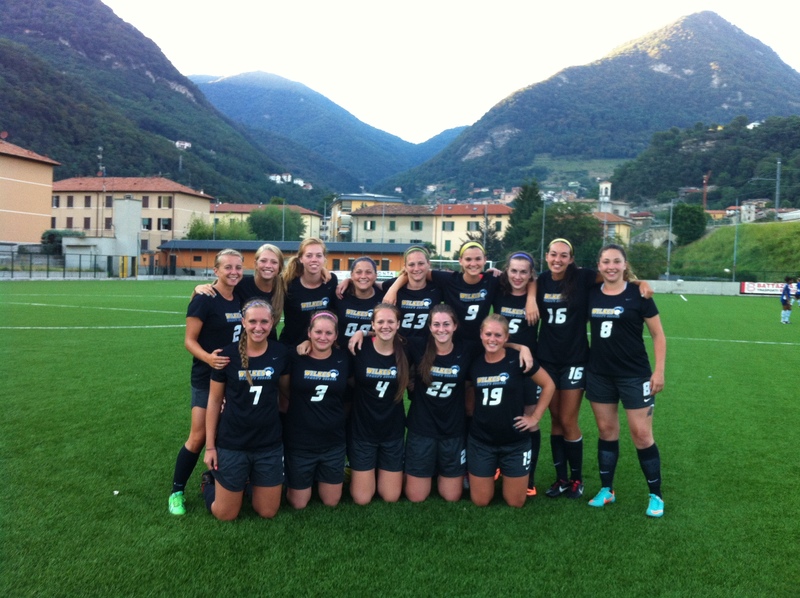 The team at the soccer field before our game! The team again before the game. We rode back to our hotel, showered, and now hanging out in our rooms. Tomorrow we get to go to Switzerland to go to an outlet mall with over 250 stores! After we shop, we will head back to Como for some gelato and more sightseeing. It’s crazy to think we only have a few days left here; we don’t want to leave! I know you got your shopping in, but did you guys look for George???? As in Clooney??? How exciting, enjoying every blog you two are sending. As they say,”Wish I was there”. Ha Ha HAVE FUN.